Seriously, is there anything better than crispy, delicious and totally satisfying deep-fried vegetables? This dish is loved by adults and kids alike! Deep-frying in this manner, with good quality oil, is a great way to nourish the body especially on those cold and windy days. Use variety of vegetables sliced thin enough so they will cook through. Fantastic vegetable options include: broccoli, carrot, mushroom, onion, string beans, sweet potato, winter squash, zucchini and for those who are bold, parsley. I promise it will not disappoint! Place flour in a large mixing bowl. Add sea salt and kuzu (optional). Add cold water to the mixing bowl and stir until batter forms. Be careful not to over stir. This batter can be made in advance and kept in the refrigerator for a few hours until ready to deep-fry. In a cast iron pot, heat oil over a medium-high flame until the oil reaches 350°F. You will want enough oil for the vegetables to be completely submerged. There are several ways to confirm the oil is hot enough without using a thermometer. One method is to drop a small amount of batter in the oil. It should sink and immediately rise. If it does not rise immediately, the oil is not hot enough. Another method is to place a wooden chopstick in the oil. If fine bubbles actively come out of the chopstick, the oil is ready. 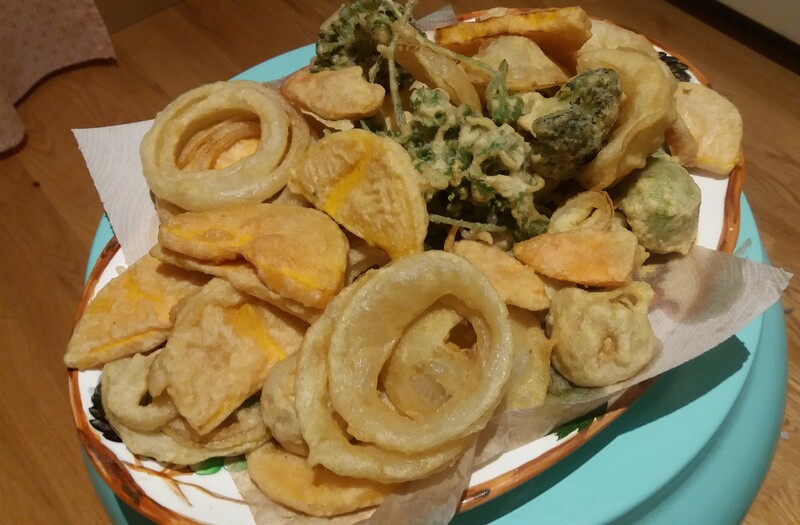 Quickly dip each sliced vegetable into the batter and gently drop into oil. I like to use wooden chopsticks to hold onto the vegetable during the process of coating it with batter and placing into the pot. Deep fry in the oil until it crisps and turns a light yellow. Do not overcook. Deep-fry only a few pieces of vegetable at a time so as to ensure the oil remains at the proper temperature. Place tempura on an unbleached paper towel to drain excess oil. For the dipping sauce, place all ingredients in a small pan and heat until boiling. Remove from heat, pour into a dipping bowl and place at the table. Serve with grated daikon or ginger as this will help to digest deep-fried foods.